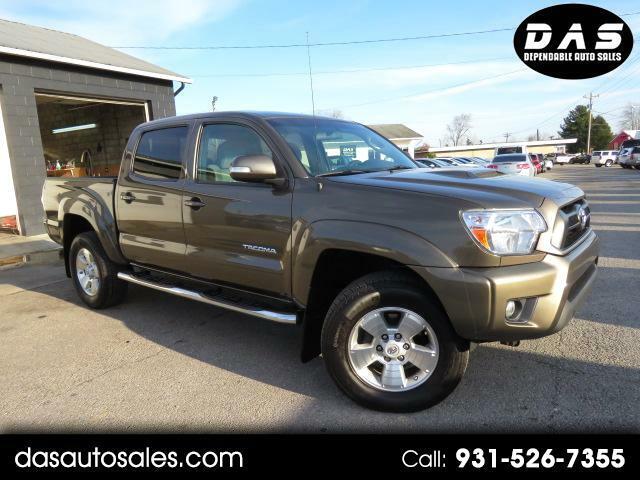 Power, guts and attitude...Our 2015 Toyota Tacoma Double Cab TRD Pro 4x4 in Magnetic Gray Metallic has it all with the heart of a full-size truck! Motivated by a 4.0 Liter V6 cranking out 236hp on demand while mated to a 5 Speed Automatic transmission. With our All Wheel Drive you can expect near 21mpg on the open road. You'll appreciate 16 inch TRD wheels and Bilstein shocks as they contribute to this ideal blend of off-road capability, utility, and fuel economy. You can tackle any job in this tough-as-nails truck with drop-in bedliner, chrome running boards and trailer hitch! Once inside our the durable, yet comfortable interior of our Tacoma TRD, you'll notice upgraded cloth seating on front bucket seats, a leather-trimmed tilt/telescopic steering wheel with audio controls, an auto-dimming rear view mirror with HomeLink, and Entune premium audio with navigation. Safety is always a priority and our Tacoma is equipped with Toyota's Star Safety System, which includes ABS brakes, electronic brake-force distribution, rearview camera, brake assist, vehicle stability control, and traction control. This sturdy truck keeps you in control. See for yourself! Print this page and call us Now... We Know You Will Enjoy Your Test Drive Towards Ownership!